In a period of time where we are truly pampered by graphical beauty and high quality stories, voice acting and gameplay (most of the time), when I decided it was time to finally visit the realm of older Final Fantasy IX games, I wondered how much I'd actually enjoy the somewhat older game. When I started playing the Final Fantasy series, I began from Final Fantasy X. Since then, I've only briefly played through I and VIII, so I haven't experienced most of the beautifully pixel-based graphics of the PS One Final Fantasy games yet. 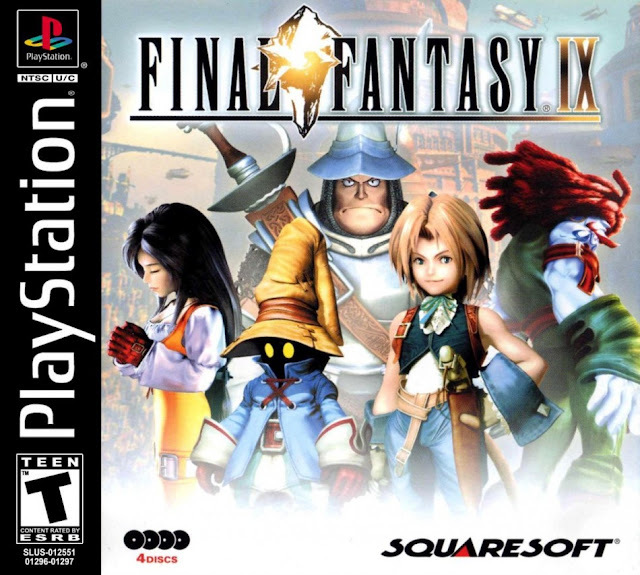 Thankfully though, gaming is much more than just graphics and finally playing Final Fantasy IX totally affirmed any thoughts that I'd been missing out on a fun game with a plot worth visiting. 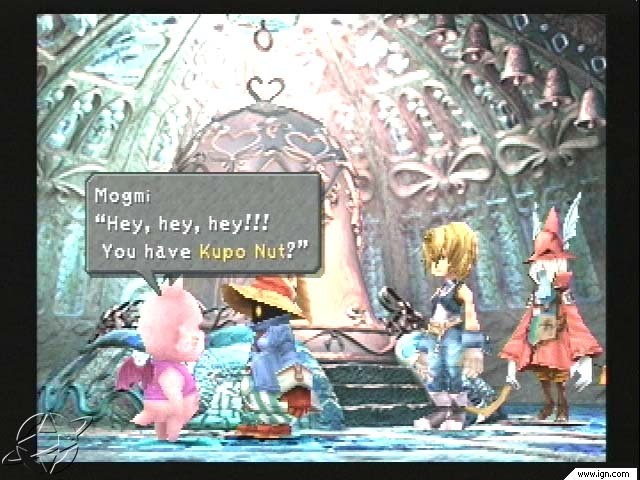 Final Fantasy IX is full of charm, with it's medieval fantasy feeling and unique characters and is topped off with some smart systems that tie into the game's battle system, is worth playing nearly 15 years after it's release. Even with it's old school graphics and feeling, thanks to the story, characters and gameplay, I definitely regret not playing it sooner. Set in a medieval world complete with a Queen and activities such as watching plays, Final Fantasy IX is firmly set in a perfect setting for a fantasy adventure, heightened by the world's painterly look that makes it look like it's set in a fantasy picture book. The story's hero Zidane is cheeky and strong-willed and is just as humorous as he is kindhearted (and feels just a little like a prototype for FFX's Tidus). He's the perfect leader for the story's oddly fitting group, which includes the knight Steiner, who is far to devoted to his duties, the innocent black mage Vivi who is trying the find his purpose in life and Princess Garnet, who becomes more admirable as the game progresses because of her genuine drive to protect her people. The odd group set out on a journey to find out and resolve many of the problems in the kingdom, including investigating the behaviour of the kingdoms leader, the princesses mother, but they also find more enemies along the way. The story explores deep themes such as life and death and one's purpose and it's villains are just as complex as the main characters. The flow of the story ties in with the game well, opening up new features to benefit the gameplay and to continue on the story as each disc/chapter is completed. Without being too specific, I truly enjoyed the growth of all the characters throughout the game, with many of the characters being effected by moments in the story and growing their own story throughout the 50+ hours of the experience. 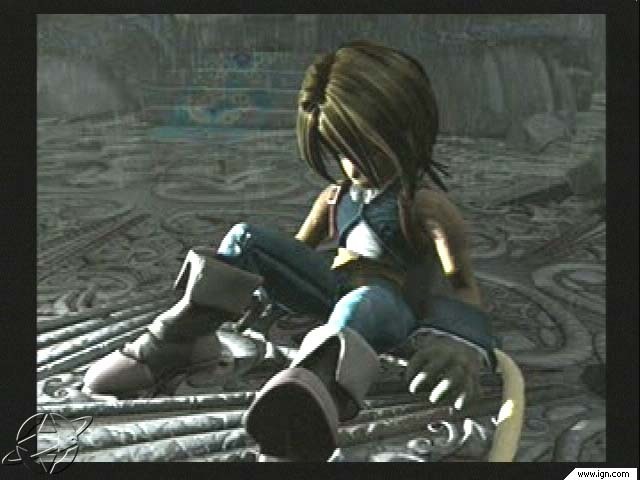 While Zidane is the main character of the story, optional Active Time Events allow the other characters to be followed almost just as closely, giving a depth to the effects of the main story. 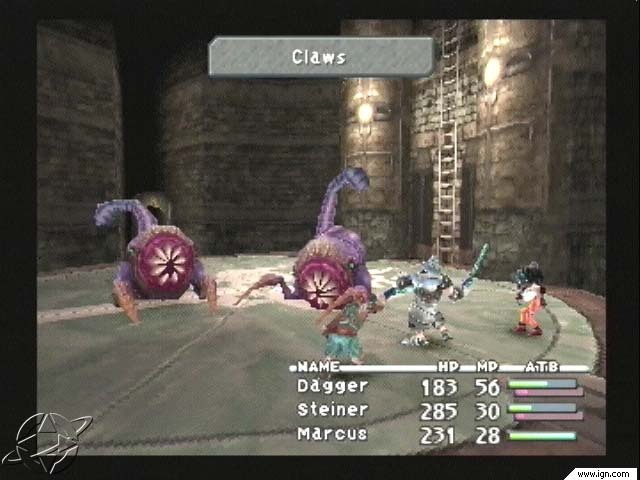 Returning in Final Fantasy IX is the familiar turn-based battle system is featured in many Final Fantasy titles, but this time with an option to make things move a little faster with the active setting found in the menu. The active setting allows you to make commands while enemies and characters are executing their moves, a much needed option considering the slow pacing of most battles, due to the long animations for each attack. I usually really love a turn based battle system, but the long animations killed the pace for me. When there's cool characters, great summons and a pumping battle track, I expect to have a fun, satisfying battle. Final Fantasy IX had all of these things, but the pace made some battles feel off and a little laggy, especially by today's standards. 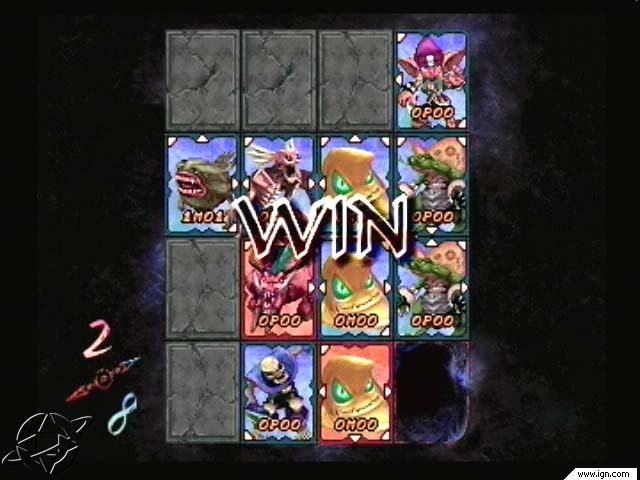 This kind of a battle pacing is a shame, as the battle system had a few cool additions, such as the trance system for each character which could be built up to change into a stronger form and some of the unique status ailments, such as the spinning status ailment that was a lot like 'Confusion' from other Final Fantasy games, but uncurable. Unfortunately though, these were not without fault either, with other status ailments sometimes being visually difficult to notice and trance on occasion not being usable at all. Because Trance automatically activates itself once it's fully changed, a character's Trance would often become triggered at the end of a battle, just as another character was executing their attack and defeating the enemy, rendering the trance meter 'used' and empty for the next battle. Battles are definitely still enjoyable for those who like a turn-based battle system and enemies are challenging enough to make things enjoyable, but I can't say it's my favourite version of the turn-based battle system used in many Final Fantasy games. Surprisingly, what I found more fun than actual battles was the equipment and ability preparation process. Rather than using a skill tree-like system seen in other Final Fantasy games, Final Fantasy IX's equipment system is built around the marriage of equipment and abilities. Each weapon, armour and accessory has an ability that the user can learn after winning the battle with it enough times, helping to create a 'bank' of abilities that the character can use throughout the whole game. When I go into battle in a JRPG, I'm used to typically prioritising strength, so this mechanic quickly added a totally different dynamic to my strategy. Sometimes I really needed strength, other times I was using low power equipment just for an ability. I was also pleasantly surprised when good equipment suddenly became weaker in some areas and I had to switch to lower level equipment because that was how equipment worked in that place. For a genre where in most games you can just level up to become totally overpowered (which I'm sure is also possible in this game too), this was a good dynamic that made the acquisition of new equipment much more interesting. The game features a few side quests, although I will say the story was so big and interesting that I didn't feel the need to explore them too much. The main side quest I tried was Chocobo Hot and Cold, a fun yet time consuming hunting game used to find items and gain points to buy some of the games rare weapons. There's also the game's card game (pictured above), which was fun enough if you're a fan of Final Fantasy's card games (which I usually skip over in favour of other side quests, unless there's a trophy involved). Despite the battle system's speed needing work, the rest of the game is sprinkled with great music, quality visuals that make the most of the technology of the time that make the experience feel fairly polished. The music is one of the best Final Fantasy soundtracks I've ever heard, spanning beautiful emotional pieces like 'Melodies of Light' along with fun, carnival-like feeling pieces for more comical scenes. Each piece truly helps to create the appropriate mood to each scene. The visuals have of course aged a little when compared to today's Final Fantasy's, but it's obvious when looking at the beautiful, storybook like landscapes and the great cutscenes that the game is still beautiful in it's own way now and made a beautiful looking game for the technology it used. Final Fantasy IX may have some problems with being a little laggy during it's battles, but a majority of the experience resonated with me 15 years after the release, thanks to the strong story, the smart equipment and abilities mechanics and the beautiful environment and musical decisions. For fans of the Final Fantasy series who haven't played the game or older Final Fantasy games, Final Fantasy IX is a great reminder of the brilliant stories Final Fantasy is known for. If you're willing to give up some of the visual and speed luxuries of today's video games, Final Fantasy IX's story is a touching story and beautiful medieval world that is worth experiencing for those with a little patience. A little laggy at times, but a wonderful that is worth experiencing with a smart equipment and battle system. You can buy Final Fantasy IX as a PS One Classic for PS3, PSP and PS Vita digitally on your local Playstation Network Store. If you're a collector of PS One games or happen to have a PS One or PS2 lying around, the physical version of Final Fantasy IX (and other Final Fantasy IX related goods) are available at Play-Asia.com.